This project can be used for online mobile store or online book store project as well. This article is about shopping cart project open source website in asp.net with c# and sql server as backend. we will go through each module of this project.we have named this project as shopping heart.for those who love shopping. Shopping cart project is divided into two main modules Admin Module and user module. Admin will enter the product details into a product category. Online user chat can be integrated with this shopping cart to resolve the queires of the shopping users. when any user clicks on the product category it will see the products in that particular category. If user selects mobile phones shopping cart will display all the mobile phones same in the case of laptops and other products. On clicking on Add to Cart the product count in the header will increase.and user can check the products by clicking on the product count. sir please give us the source code. 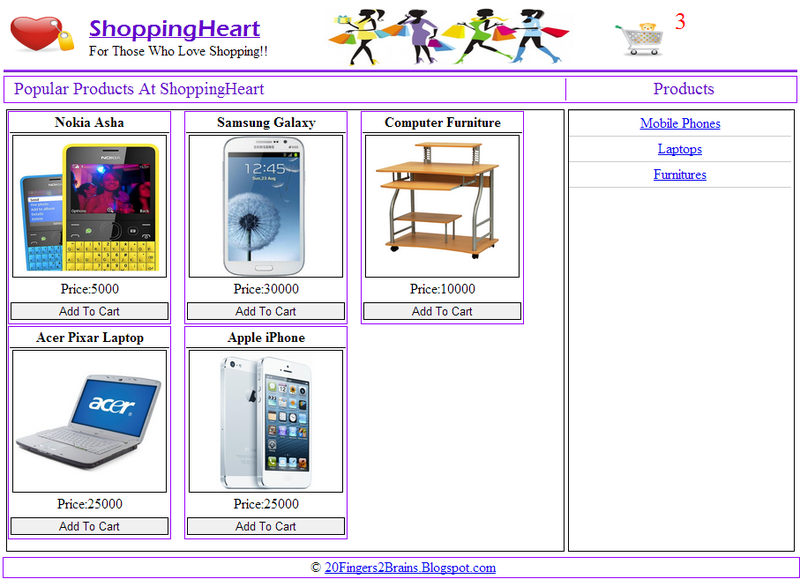 I was tried to develop shopping cart but not completed successfully. can u send me the source code. Could you send the soucecode please? Please Send Me The Source Code for Online Shopping Cart ? emineitor@hotmail.com send me source code please!!! Can I get the Sourc Code of Online Shopping Cart? Brother Send me Source code with database...Please.. Hello send me code please !! Hello could you please send me the source code !! please send me ur online shopping cart project with all source code,design and srs document..
Hi please send me source code for online shopping cart. Please mail me in .rar file of all d files of dis project. Please send me the code for the project...gartycx@gmail.com thanks. hi can u send souce code of shopping cart a I am stuck in database. efaraziz91@gmail.com. Hello, can you send me your source code and database file, please? Can you mail me source code to following Email Id? plz send me source code...its my final project.. It would be a great help if you can send me this project. I am in need of such a project very urgently. I can not thank you in words if you would be able to mail me as soon as possible. Please i really need this project source code with database file ..
You will help alot if you'll send me this project. please send me the source code to laily728@gmail.com . thank you. May I have the source code please? Can you plz send me your shopping cart source code.i need it for my project. please send me source code of online shopping cart. Hi, can you send me the source code too? neya_strwbry@yahoo.com Thanks! I hope this would be very useful for people who wants to get this for his online website. can you please send me the source code from this project. I am a student of Faculty for Engineering and Information technologies. I would use it to learn how to create a e-shop for academic purposes only. please send me the source code asap as i am developing a website and i couldn't complete this work. Can I have source code of this ? Can you send me the source code pls? Could you please send me the sources codes at gsb@lcasoft.org? Hi, Can you please send me the code at Hitchxride@gmail.com? kindly share source code of online shopping cart. Thank you for sharing this tutorials its very helpful. Thank you for sharing this tutorials which is helpful to me. Can I get the source code? geraldvance1@hotmail.com, thanks! Nice job! Please send me the project to watch and learn. I've been trying to create mine and am having some difficulties in doing so. Can you please send me the source code? This looks great and I'd like to implement a shopping cart to my existing web site. Did not answered for months!!! Thanks for the Video Lecture Also. Thanks for your lectures. Can you send me the open source code for online shopping cart ? Hello!?? can i get the source code for shopping cart project? i had seen all videos on youtube for this project it is really intresting . Admin Please can You send me Project source code at this email id razesh1111@gmail.com . Hi, may I get the source code of this online shopping cart from you?